Do you know your Soudal from your Sky, your Sunweb from your Sky? Here’s an A-Z primer on the World Tour team sponsors for 2017 and what they do. It turns out that if you want to refresh your bathroom then the pro peloton has just the sponsors you need. 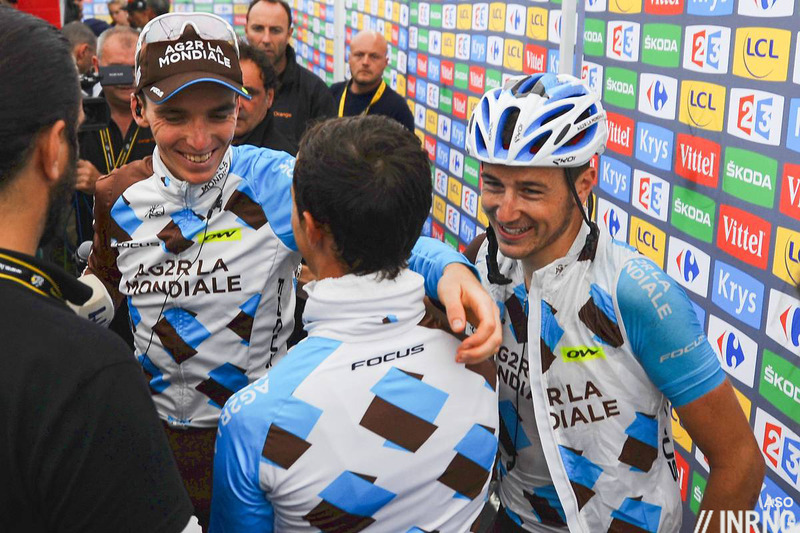 Ag2r La Mondiale: an insurance and savings company based in Paris. Note the team name is not two sponsors because Ag2r La Mondiale is the name of one company. The firm sells pension plans, healthcare and other forms of social insurance and is mutually-owned and the team places a matching publicity slant on the collective ahead of the individual. The distinctive kit features those brown shorts but there’s a poetic side as the blue and brown represent terre et ciel, or heaven and earth. Astana is the capital of Kazakhstan, a gas-rich former Soviet state that’s the size of Western Europe. The team is funded by the state sovereign wealth fund Samruk which sort of translates as “Self Seed” and the team rides to promote the country, a bid to counter the “Borat” image of Kazakhstan and pesky reports about dictatorship and poor press freedom. Has it worked? That depends, repeated doping scandals have given them a dire reputation among many who follow the sport closely but the wider, larger audience will be more familiar with their triumphs. Bahrain-Merida is a new team and sponsored by the eponymous island monarchy from the Persian gulf with various state partners from the oil company, an aluminium smelter and other agencies. Merida is a Taiwanese bike manufacturer listed on the Taiwanese stock exchange and run by the Tseng family, it started out making Raleigh bikes and owns 49% of Specialized but like many Asian manufacturers it wants to manufacturer and sell its own goods to enjoy higher margins. The team has various other Italian sponsors assembled by Alex Carrera, a rider agent know the team’s general manager. As if to prove the team’s Italian DNA they have a website with an animated home page that plays sounds. BMC Racing Team: a brand of Swiss bicycles. Once upon a time, or 1994 to be precise, these initials stood for the plain title of Bicycle Manufacturing Company. The team is registered in the US but funded by the Swiss francs of Andy Rihs, a billionaire cycling enthusiast who owns BMC and furthers the Swiss side with many a Swiss rider from Stefan Küng to Michael Schär and for 2016 they’ve picked up watch-maker Tag-Heuer as a co-sponsor to further the Swiss aspect too. Registering the team in the US helps the team to tap this large, lucrative market whilst trading on the image of Swiss quality. Some of Rihs’s other assets feature on the jersey like his La Coquillade luxury hotel near Mont Ventoux. 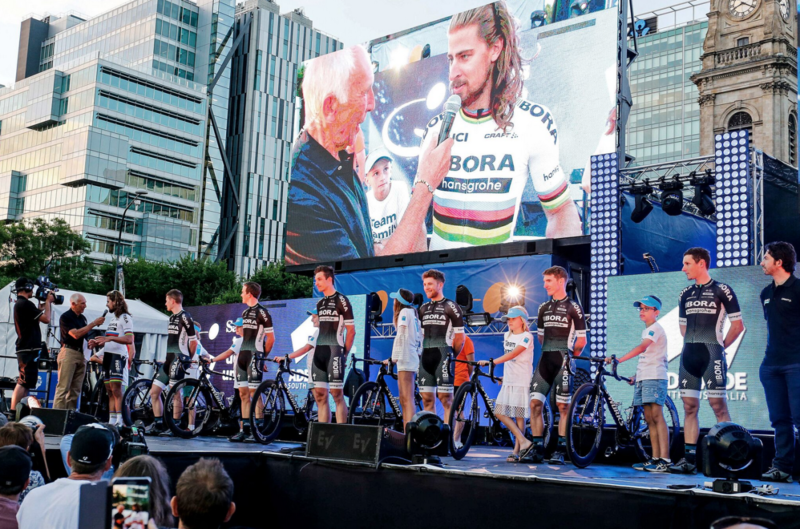 Bora-Hansgrohe is a German team sponsored by two of the country’s manufacturers. Bora make kitchen extractor fans with their selling point being that the fans are located beside the cooking hob rather than above them. Hansgrohe make plumbing parts like taps and shower heads and if they have a Germany history since being founded by Herr Hans Grohe in 1901 are these days majority owned by US conglomerate Masco. The silent partner is Specialized, the bike brand was instrumental in helping the team secure Peter Sagan and their rise into the World Tour. Cannondale-Drapac features a familiar name and a new one. In the 1990s Cannondale supplied its famous oversized alu tubed frames to the Saeco team in Italy. The company moved into motorcycles, offering innovative lightweight offroad bikes exploiting their alu tubing knowhow but this was a commercial disaster and to cut a long story short the brand was rescued by Dorel, a Canadian conglomerate that also owns Sugoi, Schwinn and GT as well as a non-cycling items like the Bébéconfort range of strollers. Now the team race on carbon frames which almost have a retro feel with no aero road frame in the range right now. The kit is green because it’s Cannondale’s corporate ident and the team retains the quirky Argyle motif. Drapac is Michael Drapac, an Australian real estate investor who is now trying to conquer the West Coast of the USA and he has been sponsoring the eponymous Drapac team which merged with Cannondale for this year. People say “dray-pack” but “dra-patch” sounds like the verb “to scratch” in various slavic languages and the team will certainly be itching for a win. The team has sponsorship from POC too which means all riders must wear the Swedish firms glasses and helmets. FDJ is short for La Française des Jeux, the French state lottery which sponsors this pro team and also various grass roots sports too. The team is a fixture on the French scene and an illustration of how globalisation may be a thing but the Tour de France means a French team can rely on huge domestic publicity every July as a means to exist. The team has explored co-sponsorship but for now the lottery has agreed to increase funding to the team in order to retain the likes of Thibaut Pinot on long term contracts. Katusha-Alpecin are a Swiss team. A team can register under whatever flag it wants and this switch from a Russian identity sees the team trying to distance itself from its image as Team Kremlin but a flag can only do so much. They’re certainly not Team Heidi, after all Katusha is the diminutive version of Ekaterina, Catherine in English and a famous Soviet wartime folk song in Russia which still gets patriotic hearts stirring today. In English you’d call them Team Kathy. New for this year is Alpecin, the German brand of caffeinated shampoo has switched teams to become a co-sponsor here. Lotto NL-Jumbo: another lottery in the shape of the Dutch state lottery. The team uses the “Lotto NL” term to signify the Netherlands lottery but the sponsor is simply Lotto to locals, presumably to differentiate from their Belgian rivals. Lotto recently merged with the state lottery, the Staatsloterij which sponsors the Roompot team. Jumbo is a chain of supermarkets in the Netherlands which has, via deal-making, grown to become the country’s second largest retail chain. This is more than a cycling team, it’s a joint venture with a speed skating team coordinated by loyalty card company Brand Loyalty. Skating is very popular in the Netherlands thanks to icy winters and all those canals but Brand Loyalty has plans to make the Dutch team more international. Lotto-Soudal sees is go from one state lottery to another with Lotto being the Belgian state lottery. This sponsorship is the longest single team backing in the pro ranks but increasingly subject to political scrutiny and points-scoring as politicians question the money spent. Soudal is a Belgian business making adhesives and sealants, a staple in DIY stores in Europe and beyond and the team has done some amusing sponsorship videos to highlight this, a means to bring alive otherwise dull products. Movistar is a mobile telecoms operator with activities in Spain and Latin America as well as in the UK and Germany under the separate O2 brand. Their rider roster reflects this geographic distribution perfectly with a Spanish core of riders from across the country plus Nairo Quintana of Colombia and Andrey Amador in Costa Rica as well as British rider and a German too. Orica-Scott have a new co-sponsor on board. Orica is an Australian company that makes explosives and other speciality chemicals for the mining industry that ought to have ACDC’s TNT as it’s corporate theme, especially as it bought Nobel, the Norwegian dynamite firm several years ago. Reassuringly it’s hard to buy Orica products so why are they backing a team? Well the company does not have a great reputation after explosive disasters as well as several fines for environmental damage so sponsoring a cycling team is seen as a way to put something back and to associate the name with something fun. Scott is a Swiss-American bike brand, registered in Switzerland but with a US heritage and with the departure of the IAM Cycling team Scott are all-in for the Australian team and have stepped-up as a naming rights sponsor. Quick Step Floors is the official name for what everyone is going to call Quick Step this year. It is a brand of laminated flooring that might seem indissociable from Belgian cycling but it belongs to company founded in Amsterdam… Amsterdam, New York called Mohawk Industries, a giant supplier of commercial and residential flooring and the team a cosmopolitan recruitment policy to spread the sponsor’s name far beyond Belgium. German discount supermarket Lidl appears on the kit again while Belgium’s Latexco make rubber mattresses and it and the Maes family have backed team manager Patrick Lefevere since the 1990s. 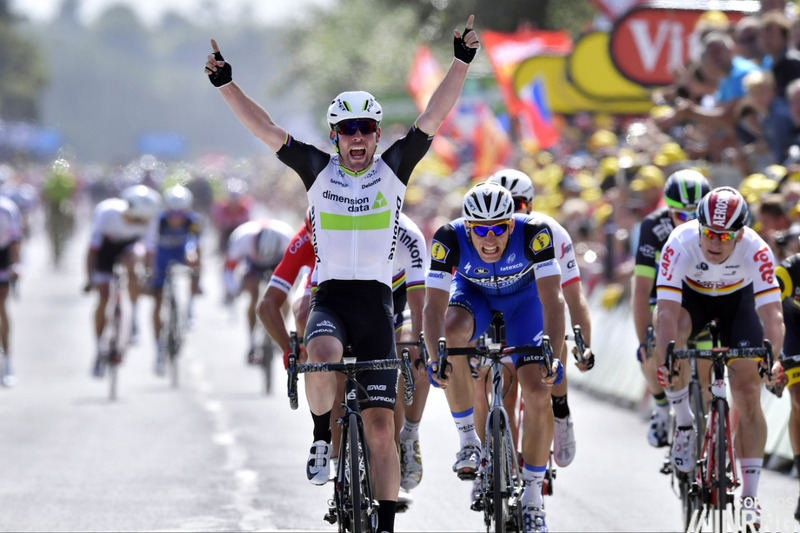 Team Dimension Data: is sponsored by a corporate cloud computing and IT outsourcing firm from South African with an international history. “Di Data” used to be traded on London’s stock exchange before it was aquired by Japanese telecoms giant NTT. The team is also backed by blue-chip accountancy firm Deloitte, plus Sapinda, a Dutch investment fund that backs African projects. There’s also Oakley sunglasses, the brand belonging to Italian sunglass giant Luxxotica; and Nederberg, a South African winery and the team retains the partnership with bicycle development charity Qhubeka. Team Sky is backed by the British TV company Sky which is branching out into telecoms too. The firm has operations in Britain and recently took full control of its businesses in Germany and Italy too where the Sky name is a thing as well. As a company Sky is 40% owned by 21st Century Fox of the US and ultimately controlled by the cosmopolitan Murdoch family and currently 21st Century Fox/the Murdoch family are in takeover talks to buy the 60% of Sky they do not own, a means to combine Fox’s content with Sky’s distribution network. If the takeover deal goes through expect the Sky name to last as its a brand but how long will the team go on? There’s controversy and if there’s no smoking gun there’s aggro and sponsor may still feel they’ve got their money’s worth from the team. Perhaps Ford will step-up to replace them? Team Sunweb was Giant-Alpecin last year. Sunweb is a European tour operator that is part of the Swiss-Dutch Sundio Group, essentially a Dutch company but with its HQ in Switzerland and if you follow them on social media you’ll see their hashtag “CreatingMemories”, a way to sell the sizzle rather than the steak of holidays. Giant remains the bike sponsor and is very visble on the team kit even if it has stepped down from naming rights. The team has BMW’s Mini brand as a vehicle supplier and Belgian steel shutter and blinds company Renson appears on the shorts. Trek-Segafredo is the combination of US bike brand Trek and Italian coffee Segafredo. Trek should be familiar while Segafredo literally means “cold saw” in Italian but it’s an Italian coffee giant controlled by founder Massimo Zanetti that floated on the stock exchange last year and whose stock has duly fallen 40%. I had never considered what Soudal did until last year when I wandered into my local DIY store looking for some expander foam. Soudal caught my eye so I purchased it there and then ahead of the own brand stuff that was a few quid cheaper – definitive proof that cycling advertising works. Ahem. I bought some quickstep flooring last year for exactly the same reason! I just bought myself some Orica dynamites for the same reasons ! Red Bull’s target audience has little overlap with road racing. They’ve done some events though, look up the Red Bull “Road Rage” events for descending tips. I just watched one, woah, quite surprised how old some of the competitors were (I get slower going downhill as I get older). Really enjoyed the little notes on team origins. Easy to get the impression that teams have come and gone quickly but interesting that many have a decent history and have just been reincarnated with new sponsors. Inrng – I’d argue that your last sentence is slightly optimistic! Compare cycling teams’ history with any other sport and cycling appears to have a drastic problem! Only 2-3 teams can trace their roots to the 80’s (the 1980’s, not the 1880’s), which is pretty pitiful compared to NHL, Premier League Soccer, MLB, etc. These other sports have the opposite, rather than a handful of teams that have survived since the 80’s, for them, only a handful of teams (or none) have failed since the 80’s! I suspect if you look at the premier league soccer that many of the teams from the 1980s have been relegated or even gone bankrupt. But point taken, the idea was merely to say that there is stability for some, mainly those with a giant, steady domestic audience but even Italian teams have gone despite a home grand tour etc. Roughly half of the teams in the old First Division in any given season in the 1980s are in the Premiership now. None have gone bankrupt, though Wimbledon moved and changed their name. I think the last club to be in the top flight of English football who subsequently went bust were Bradford Park Avenue, who were there in the 1920/21 season. Leeds United went into insolvency in 2006-7. The club, as an asset of an insolvent company was subsequently bought whilst the legal entity was liquidated, so it somewhat depends on your definition of bankrupt. Name change, equipment change, livery change, personnel change, location change etc etc. It’s akin to going from Wimbledon FC to MK Dons FC every couple of years. Thank you – that made me smile. I used that reference (in a different context) with some friends many years ago and got nought but blank looks. Is it a fair comparison? In those team sports, most sides have their own grounds with regular revenue streams and, in the worst circumstances, some valuable real estate to sell off. Cycling doesn’t have that, given its peripatetic nature. Perhaps F1 is a more appropriate comparison; how many of its teams were around in the 1980s? Apart from Ferrari, Mercedes, McLaren, Williams and Renault, the rest are recent creations, aren’t they? Nick – exactly, cycling’s team structure (and inherent instability) has many similarities with Formula 1. Teams really just don’t have a major low risk asset and revenue stream to get a firm footing. Inrng – It definitely is interesting to see how some teams have evolved from 1980’s and prior year incarnations. Thanks for mentioning that, and I wonder if a more indepth look at this would be a future article! Thanks for opening this discussion! Mercedes team has only been around e few years. They took over Brawn, who used to be Honda, which i believe started early 2000’s. Renault has come and gone a few times and is not the same team. Real long termers are just Ferrari, Mclaren and Williams. on another cycling website. This is the same guy who sat out 18 months for doping I guess? So much for the German anti-doping stance. The sponsors should have told their golden boy Sagan that this guy wouldn’t be part of the package. Just when the Germans decide pro cycling’s clean enough to start broadcasting LeTour again, their big-money team with the World Champon takes on a director with this history? They don’t know or think it doesn’t matter? Neither is very smart IMHO. Possibly on a slightly superficial level, though perhaps not, but I can’t help but feel some discomfort at the mosque symbol on the UAE Abu Dhabi jerseys. Looks to me like the skyline of a typical old town on the Arabian peninsula. “Possibly on a slightly superficial level, though perhaps not, but I can’t help but feel some discomfort at the church symbol on the Katusha jerseys. It’s not the first, see the cross on the Swiss flag sported by every Swiss national champion or Peter Sagan in the Slovakian national champions kit with the double cross on it. Fair points about the flags, though you could say that they are the national symbols anyway. Whereas the UAE flag is the red / green / white / black blocks only. And I still call it hypocritical. As hinted in my previous post, as Katusha had the St. Basil cathedral from the moscow skyline on their jerseys nobody complained about it being a religious symbol. And don’t tell me that that skyline is iconic. That mosque might be in UAE as iconic for Abu Dhabi as the Red Square skyline for Moscow. And as it is known Abu Dhabi tries to establish itself as touristic destination and since this team is a vehicle to promote that emirate/city it is totally legitimate to use some (potentially) iconic landmark. Such comments as yours are neither informative nor helpful and just fire (humans inherent) xenophobia. Please note that my initial point was about religious symbols on jerseys, of which the mosque was the current example. As you correctly stated, Katusha did so also. I make no other point than that. But, in any case, as Inner Ring also advised, national flags can have their origins in religion too. So point taken. Please do not jump to any conclusions more than that. Why shouldn’t religion be visible in cycling? Ask anyone from Filippo Ganna to Gino Bartali if their religion matters in their cycling. Count the crucfixes kissed before races. Remember Zakarin talking about praying on the bike? So why shouldn’t a symbol be there? Pedantry corner: Weren’t Lidl in the Quick Step jerseys last year too? I don’t know if that was an intentional nugget but it certainly made me smile! On the POC side, the Swedish company, that was owned by backcountry skiing/climbing company Black Diamond of Salt Lake City, but then sold to…. Bahrain based Investcorp a bit over a year ago. It’s worth noting because it probably means the riders can’t cut their own endorsement deals with a sunglasses brand. It happens on other teams too, they have collective sponsorship deals. Some riders seem to cut their own deals using equipment from suppliers other than team sponsors. In today’s men’s peloton Froome’s chain rings come to mind, then there was Linda Villumsen’s use of a non-sponsor bike at the 2015 World Championships time trial. And, for those with longer memories, Chris Boardman set the hour record on a Lotus frame covered in Eddy Merckx stickers, as Merckx was his bike sponsor at the time. And Jan Ullrich riding Berlin based carbon manufacturer FES TT rigs with pinarello and later giant stickers. Or Cavendish wearing Nike shoes while he had a Limited Edition Specialized Cav line out (which included white with green sole S-Works shoes). as a citizen of a country that happened to be liberated by the the Soviet army in the WW2 I would like to add that you missed one very important meaning of the word Katusha. It is also a nickname for the famous Soviet vehicle mounted multiple rocket launcher used in WW2. And I am quite sure this played no little part in naming the team. I’ve seen people saying the team was named after the rocket launcher but it’s not the case. But it does bring associations of this to many and the patriotic song which presumably gave its name to the rocket launcher evokes the “motherland”. Given the military/nationalistic connotations of the name I find it a genuinely interesting choice. I know it is a complex topic, but if the German government decided to back a team I suspect it would be not be Team Wacht Am Rhein? I have no knowledge of Russian culture, so any thoughts from people who do would be much appreciated. Just a very minor correction: when talking about Movistar, you said they have “[…] lineage going back to 1980 and the Reynolds team with José Miguel Echavarri at the helm during all this time”. Actually Echavarri stepped back from all his team duties circa 2008 and Eusebio Unzúe (a founder of the team himself) is the head of the team since then. Spanish newspaper El País featured an interview with both on them in late 2007 about the transition (http://elpais.com/diario/2007/12/24/deportes/1198450829_850215.html). Of course and thanks for pointing this out and the nice interview. Have fixed the text above. I’d love a Bora – my head is mostly scar tissue. Why don’t Specialized up their sponsorship a bit and get on the shirt? Is it the potential loss of being bike sponsor of other teams? A lot to dislike about a lot of those sponsors (and some teams – what persuaded Alpecin to move to Katusha? ), perhaps POC’s helmets and glasses most of all. Ha! While PROs can make most things look better, and just about anything look good, I’ve NEVER seen the POC Octal helmet look anything less than awful on anyone. I feel sorry for the guys have to wear those and getting snapped in photos that will live on for ages. Ugh. Regarding sponsorship of bikes. Look closely and most of the team bikes are just sponsor stickers as the actual product is not of high standard. That’s very rare these days but if you have some examples please share. Agreed with Inrng – you rarely see that these days. For one, the quality of team bikes has improved greatly and secondly, product differentiation (eg. shape of carbon moulds) makes it very difficult to do this any longer. In the past the steel and aluminum framesets were very similar in appearance so you could do this, but not any longer. I do wonder if sponsors ever change the carbon layup in the team frames. The frames would use the same molds but have different characteristics than stock frames. Also, I think I remember an article saying that Cannondale made a custom frame for Peter Sagan (when he was riding Cannondale bikes) that had a longer than normal top tube. But I guess Peter Sagan probably is probably an outlier in terms of what a frame maker is willing to do to accommodate him! I’m pretty sure Boonen used to ride a Specialized with a custom “long and low” geometry. Not sure if his new Venge/Tarmac/Roubaix are different to the off-the-peg frames. Not only a custom frame as such, rumour goes that for the MilanoSanremo (either Cioleks year, or the year Nibali was in the 3-man group) Peter was riding an alluminium frame just because of the crucial Poggio downhill and the frame sensitivity. The subject of marketing stuff as “what your hero actually uses” would fill up a bunch of posts! I find it amusing that so many who follow the sport so closely seem to be so ignorant on this subject. I’d say they don’t care except they DO, they buy all the stuff the marketing-mavens tell them their hero uses, whether it’s a bike branded as team-issue when the hero’s bike was actually made by a classic “builder of trust” (usually Italian – is it just because they make the best bikes or because they are best at keeping the secrets?) or clothing, shoes, etc. But of course it’s not limited to cycling – one of my favorite instances was back when MOTOGP could be watched free over-the-air and a star rider sponsored by one of the “energy drink” companies swigged from a can that was (by accident I’m sure) shown just seconds before being filled with water by one of the team minions as he waited for the star to arrive post-race. if you were referring to the alu frame – i don’t know if that has ever been mentioned anywhere by the bike manufacturer back then. That info comes from somewhere else..
Wow, I had no idea Quick Step could be traced back to an Iroquois-named company in upstate New York, which is where I’m from. Huh. I’m also pretty sure Sagan had a custom geo Cannondale, something like effectively a 54cm frame with a 58 top tube? And for Cannondale, isn’t their corporate green a transfer from old co-sponsor Liquigas? Back in the day when Cipo was racing Saeco Cannondales they were all (road or mtb) red with yellow logos.